One person, two awesome ideas, millions of happy users. How is it that lighting can strike not once but twice with one person. 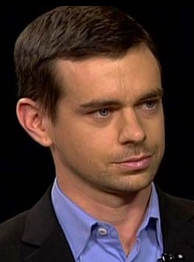 Jack Dorsey, @jack co-founder of Twitter and founder of Square has been in the right place at the right time with amazingly successful services. Twitter has made the distribution of information to the masses both quick and easy. Square up has simplified how small businesses accept credit cards. Jack’s ultimate goal in life is to make complex things simple. He sat down with Charlie Rose on the Charlie Rose Show @CharlieRoseShow and explained how challenging it is to make things go from the very difficult to something that becomes very manageable and effortless. Take a look and give us some feedback on how you use both Twitter and Square. Click here to check out the full interview.